There is a renewed and increased interest in this era of guitars. Original examples are increasingly scarce and expensive. This has led Gibson to make some initial experiments into recreating them for the modern masses. These guitars fit into three categories: Standard, Deluxe (Mini-humbuckered GT's) and Custom. In 2013 or so, Gibson finally announced a '68 Les Paul Standard Custom Shop reissue with the Tom Scholz Collector's Choice model. I think it would be great fun if they popped a crown headstock overlay from a current ES-335 on a Scholz to make a super early, 68 crown guitar reissue. In 2015, Edwin Wilson has announced a first try at an Historic/Custom Shop level reissue of the 1968 Les Paul Custom. It turns out that this was just the prelude to the 2018 50th Anniversary Series of instruments. Previously, none of the currently "reissued" LSLP's were truly accurate. Does that matter? Probably not, it's really up to you. 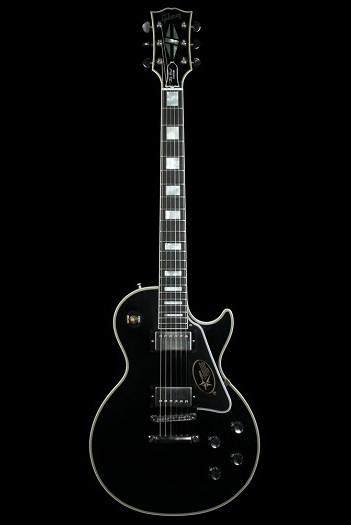 The late 90's and 2000's 'Les Paul Deluxe' was a standard, USA production guitar. The 'Les Paul Customs' are made in the Custom Shop. The Scholz model is really great, but very expensive as a limited-production, Custom Shop model. 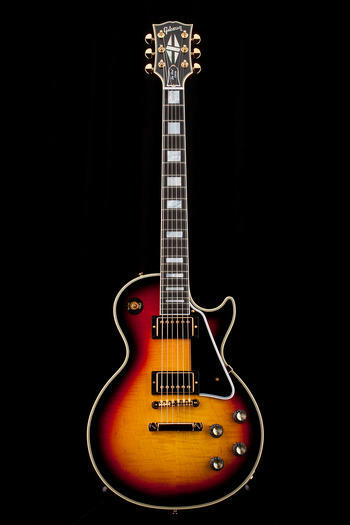 The Historic LPC for 2015 was more affordable than the Scholz model, as is the 2018 50th Anniversary Les Paul Custom. 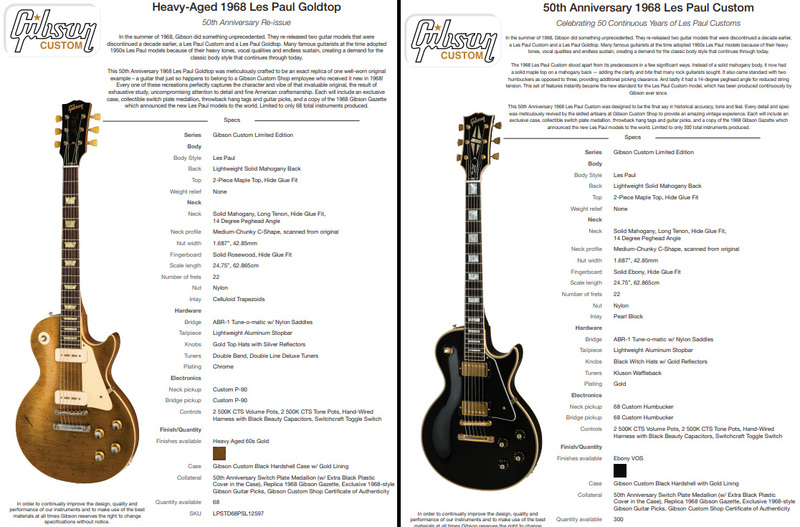 The Heavy Aged 50th 68 Les Paul Standard model is more expensive because of the hand aging process. All represent a bargain compared to original examples which continue to rise in value. PLEASE NOTE: This area will never be as detailed as the rest of the site. I just want it to be a general information section. I don't keep tabs on the modern guitars as much. Don't get me wrong though, I love 'em. I played a killer "Custom Authentic" LPC a while back that was very, very nice. This 50th Anniversary 1968 Les Paul Goldtop was meticulously crafted to be an exact replica of one well-worn original example - a guitar that just so happens to belong to a Gibson Custom Shop employee who received it new in 1968! Every one of these recreations perfectly captures the character and vibe of that invaluable original, the result of exhaustive study, uncompromising attention to detail and fine American craftsmanship. Each will include an exclusive case, collectible switch plate medallion, throwback hang tags and guitar picks, and a copy of the 1968 Gibson Gazette which announced the new Les Paul models to the world. Limited to only 68 total instruments produced. The 1968 Les Paul Custom stood apart from its predecessors in a few significant ways. Instead of a solid mahogany body, it now had a solid maple top on a mahogany back - adding the clarity and bite that many rock guitarists sought. It also came standard with two humbuckers as opposed to three, providing additional picking clearance. And lastly it had a 14-degree peghead angle for reduced string tension. This set of features instantly became the new standard for the Les Paul Custom model, which has been produced continuously by Gibson ever since. This 50th Anniversary 1968 Les Paul Custom was designed to be the final say in historical accuracy, tone and feel. Every detail and spec was meticulously revived by the skilled artisans at Gibson Custom Shop to provide an amazing vintage experience. 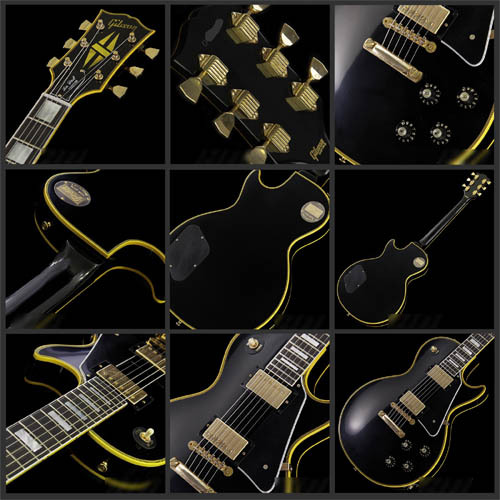 Each will include an exclusive case, collectible switch plate medallion, throwback hang tags and guitar picks, and a copy of the 1968 Gibson Gazette which announced the new Les Paul models to the world. Limited to only 300 total instruments produced. This is some really great news for fans of maple capped LPC's! Initially released as Japan-only model for our rocking brothers and sisters across the Pacific, this model is now available here in the USA. Previously, there was no Historic Series option for a maple topped LPC, as the 50's RI's have a Mahogany cap. I can't tell you how exciting it is to see Gibson Custom take the time to spruce up this model. Edwin Wilson, head of Gibson Custom, confirms the model in the YouTube video below (fast forward to 5:30). Correct Neck Shape -- Profile named "1968 Les Paul Custom"
NOTE: FAST FORWARD TO 5:30, thanks! 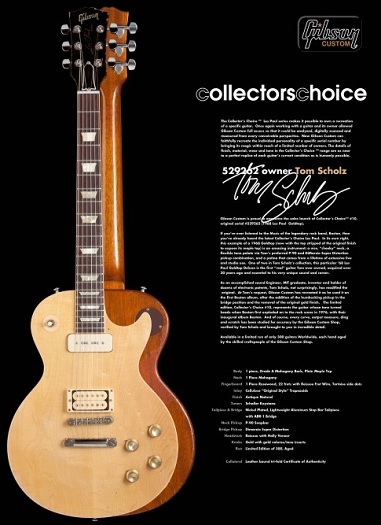 "Collector's Choice #10 - Tom Scholz 1968 Les Paul"
This is a REALLY cool model for LSLP nerds. Finally, a proper effort by Gibson to reissue a 529262-era replica. Headstock pitch is even correct! The inlays are the new, 50's correct style which is wrong for this model, but that's forgiveable. They should be the USA production material with rounded corners. Obviously, Scholz modded the heck out of this, and Gibson has worked to replicate those features. Dave's Guitars, Gibson.com & The Music Zoo, Img & Txt, July. 2013. $9,409 MSRP -- Ouch! The street price is much less though. Want to make your modern, '68 Reissue Les Paul Custom more accurate? WD Music (what seems to be Kluson's resale front) has this description of the Super Klusons: "This top of the line tuner is known as the Waffleback and has been absent from the market for 40 years. Kluson is proud to reintroduce this tuner, which was used on numerous high end Gibson Les Pauls, ES-355, Super 400, L5 and early Les Paul SG Customs." A thing to keep in mind if you are considering upgrading your '68 Reissue or restoring your original guitar: If you are converting from Grovers, you will potentially need "Conversion Bushings" to make your 3/8 holes work with the smaller push in bushings that Kluson's use. Kluson's use 11/32nd" holes standard. The critical issue is that the larger washers from Grovers may have left impressions in your finish which will be visible as circle-shaped dents around your new Super Kluson bushings. Even worse, my Early Reissue 1969 LPC has had Grovers on it since the early 1970s. The washers have become one with my headstock's finish, and if I were to remove them, my finish would come off as well. On a multiple thousand dollar guitar, that is not acceptable! So be VERY careful when restoring Super Klusons to original guitars that have had Grovers for a long period of time. On modern reissues, it is possible there may be light impressions in your headstock from your factory Grovers, so keep that in mind. "1968 Les Paul Custom Flame Top"
"With its distinctive style and long list of appointments, the 1968 Les Paul Custom has long been a favorite of players and collectors. Featuring the trademark split diamond headstock inlay and lavishly bound body, this Les Paul Custom version adds a carved, flame maple top. 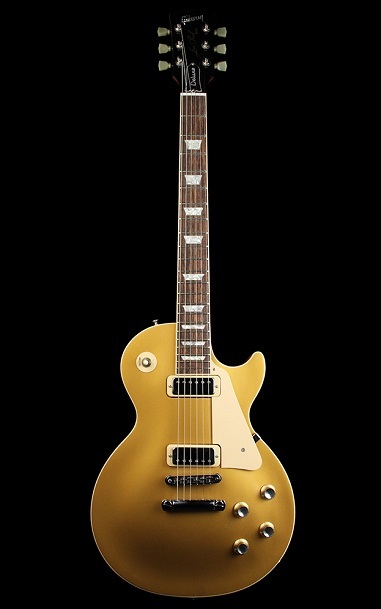 The guitar's '57 Classic humbuckers provide the smoothest, richest tone of any of the Gibson pickups while gold hardware adds a sumptuous glow under the stage lights." MF, Sept. 2011. Image from Guitar Center, July. 2013. "Limited Run Les Paul Deluxe"
MF Txt, Sept. 2011. Image Music Zoo. Identical features to the Figured model, but in solid colors. 90% of them will be in black. Usually the other 10% are usually 'vintage white', which is a barely cream, white color. Similar to Randy Rhoads' 1974 LPC. It is tricky to find these in stock as Gibson just makes them in small batches and does not promote them on their website. Even trickier, you can find them in a gloss finish, which typically is an upcharge. This model has unfortunately been discontinued. It featured a dulled black finish, dulled nickel hardware, a light tailpiece, ABR bridge, 1-pc construction, tall pickup rings, and a long neck tenon. It had a hefty neck with a full 17-degree tilt headstock. Briefly, its knobs were incorrect, the headstock pitch was incorrect, its truss rod cover was incorrect, etc, etc... It was a VERY high quality instrument built in the Custom Shop to the highest of Gibsons standards. It featured 57 Classic pickups originally and eventually changed to BB's. I think it was probably made from about 1998-2003 or so. Was probabaly the first Gibson "VOS" type finish, although I am not sure if it is the same process to dull the finish. The current VOS model is the successor. Basically, there was a 69 Deluxe RI (a NON CUSTOM SHOP guitar) as a limited edition in the late 90s early 2000's. It was similar to the current limited production guitar with the exception that the 69 RI's had a solid body, not-chambered. There may be more differences, not really sure. No long tenon. No transitional tenon. It has the modern rocker joint and Nashville TOM bridge. No pancake body, no 3-pc neck. No volute. Small headstock. No lightweight tailpiece. Typical 90's neck. Mostly available in Black, Wine Red, and GT.